Often the most memorable parts of a family vacation are the ones that weren't a component of the original itinerary. A similar scenario occurred recently on a Hay & Forage Grower editorial trip through southern Missouri in early June. The purpose of the trip was to visit a slug of dairy and beef farms, look for potential stories, and shoot some pictures. What wasn't on the trip planner was to see massive amounts of poison hemlock, an invasive weed that also happens to be toxic to both livestock and humans. Poison hemlock was everywhere across the southern region of the Show-Me State; it was in fencerows, pastures, road ditches, along interstate highways, and growing out of the concrete cracks at your favorite convenience store parking lot. It was clear I had reached poison hemlock ground zero. All of it was in full bloom, its presence less of a shock than the sheer quantity and distribution. Following our Missouri trip, Hay & Forage Grower contacted Tim Schnakenberg, an extension regional agronomist based out of Galena in southwest Missouri. "Poison hemlock has gotten steadily worse in recent years. Most people do not remember it being in this area during their growing up years, but now it can completely inundate a farm," says Schnakenberg. An erect biennial, poison hemlock grows from 4 to 6 feet tall. In the first year, it develops a basal rosette of leaves; the second year developing a vegetative stem and flowers. The flowers are white, arranged in a compound umbel pattern. Seed production is prolific with each plant having the capacity to produce up to 38,000 seeds. All parts of poison hemlock plant are toxic. The plant's poisonous juice was used in ancient Greece as a means of executing criminals and political prisoners, including Socrates. Literature indicates the most toxic alkaloids are highest in concentration during the vegetative stage. Schnakenberg says the good news is that cattle tend to avoid it. He continues, "Livestock producers here see it as an invasive issue, taking large areas of land out of grass production. When it comes in, the grass below it dies out, leaving pastures useless. It takes 2 to 5 pounds per 1,000 pounds of body weight to be lethal to livestock." 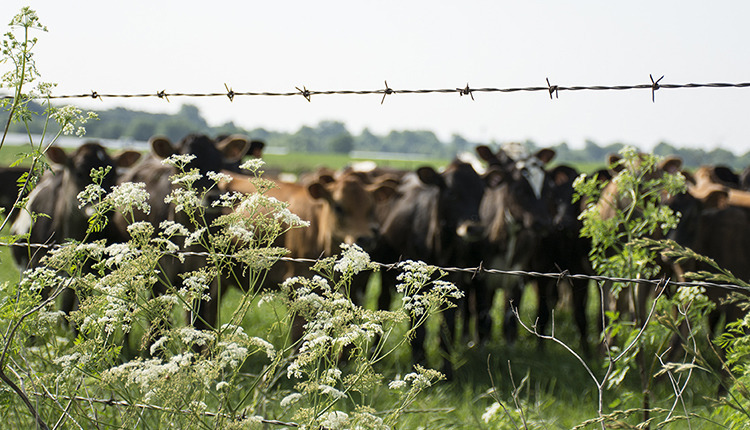 Schnakenberg indicates that poison hemlock has recently started to find its way into mechanically harvested hay fields; farmers are concerned that livestock may be less likely to avoid the plant in the feed rack. If addressed early, poison hemlock is relatively easy to control. The plant is most susceptible in the rosette stage, before stem production initiates. In Missouri, Schnakenberg recommends spraying anytime from October to April when temperatures are 55° or higher and it is sunny. He says they've seen the most effective results with the herbicides Tordon 22K, Crossbow and Grazon P+D. There are other herbicides labeled for poison hemlock, but timing is critical for effective results. Poison hemlock is by no means limited to southern Missouri. It can be found in virtually every U.S. state. Even if you're willing to take the gamble that livestock will avoid the plant, its invasive nature alone calls for quick and diligent control measures.